Ok, so technically our April comment happened in March but who is counting! 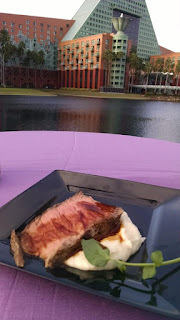 We were finally able to get our hands on the book - Keeping Keto at Disney by Christine Fox. As we have both been following this way of eating, we were anxious to get our hands on a copy and read it. Then we were lucky enough to interview Christine on show 254. Listen out for more chats with Christine in the upcoming months! March was a month of celebrations because our very own Becky Manion managed to travel on all four of the Disney Cruise Line ships! So she popped by to tell us about her most recent trip. 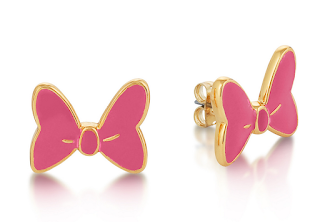 Find our more on show 252. February saw us welcoming Liz Read to the team. Liz is an annual pass holder for Disneyland Paris but she has also visited Walt Disney World. Liz is a self-confessed character obsessive and thinks nothing of hopping on the Eurostar for a character meet. 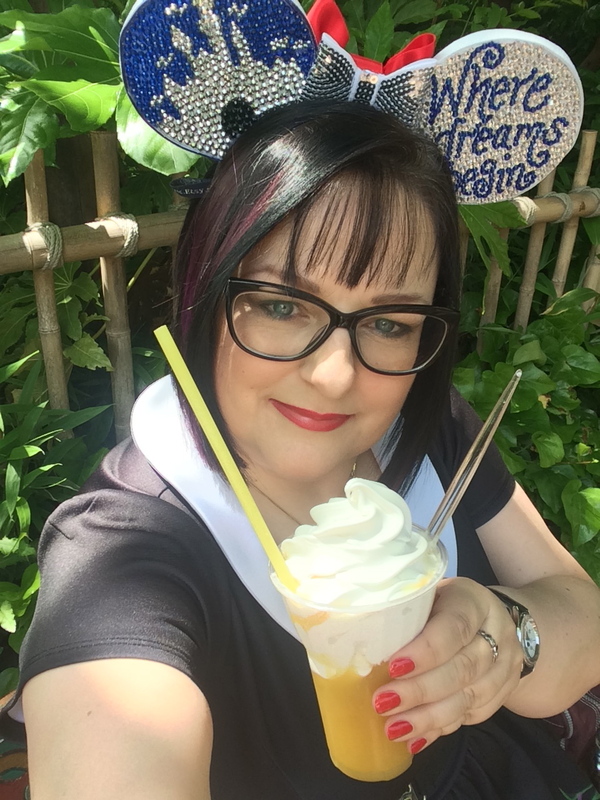 Hear Liz on show 249 as well as our Patreon shows and she will be providing us with first hand DLP content each month. 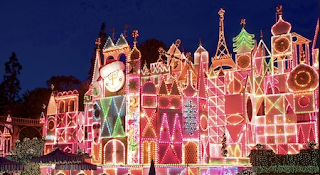 Christmas has been and gone and it is time to ramp up thoughts of getting in some Disney this year! 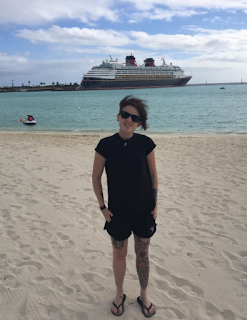 As yet, Jayne has not been able to commit to a trip (not from lack of wishing) but Michelle has her outstanding placeholder cruise and a Walt Disney World trip planned. Sadly, the cruise does look like it will be pushed back to 2020 due to commitments with the Army Cadets but at least it isn't cancelled! Another plus, there is a fabulous 17 day trip to Disney to plan! Santa has been! Well this year both Jayne and I have been blessed by the friendships extended to us by our Disney Dream Girls family. Surely this alone is the greatest gift you could wish for! Alongside that, we both received lots of gifts from our friends and family that had that subtle Disney touch! So this is the time I truly start my Christmas prep! 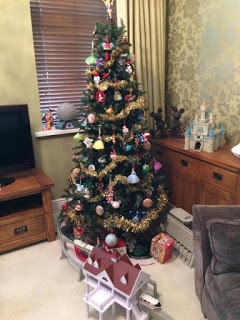 Alas there is no Christmas trip planned for either Jayne or myself this year but it still means we can put up the Disney tree and purchase lots of Disney gifts for our Disney friends and family. 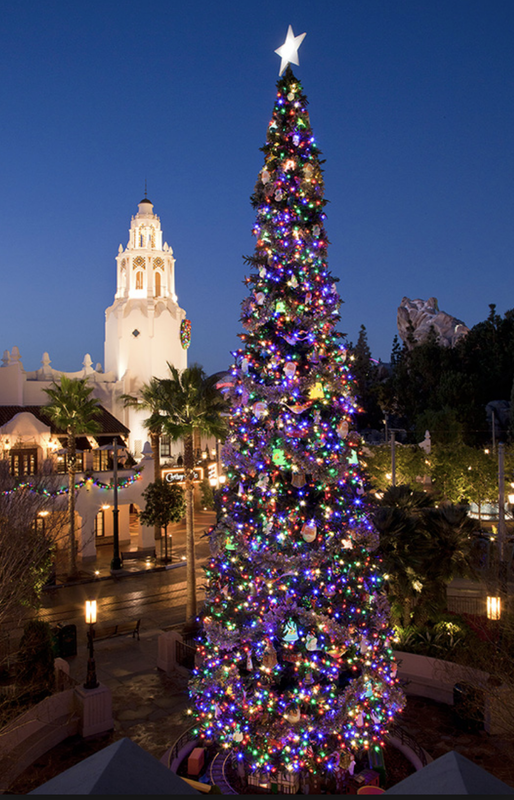 Any of you have plans for a Disney trip this Christmas? Please send us pictures if you do! The spooky season is here! 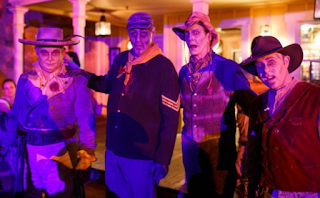 Did you manage to enjoy any of the Halloween offerings in the Disney parks? Having attended MNSSHP four times now, I am still astounded to say that I have yet to see the Cadaver Dans! What about you? What is outstanding on your Disney wish list? Wow! What a holiday! Nearly weeks of Disney literally flew by. 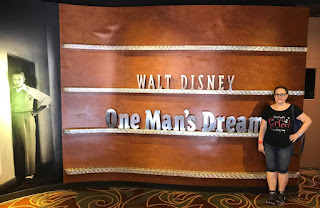 As you recall, I have 6 days in Walt Disney World, a 7 night cruise on the Disney Fantasy and finally a further 7 days in Walt Disney World. I feel blessed and very fortunate to have been able to do this. So, over the next month or so, I will be sharing lots of reviews, reports and information about this trip - so stayed tuned! It is here! Holiday month! So as I write this, I am one day away from getting on the plane to Orlando. This trip has had literally hours of planning! Because I am meeting friends from Canada and Australia there has been lots of Skype calls and Facebook conversations to fine tune things. I suppose you can go to Walt Disney World without doing a day of planning but I would ask anyone who does this is why? The planning itself has given me hours of fun! Salivating over menus, watching attraction videos, scanning the internet for top tips - all of this have added to the trip! 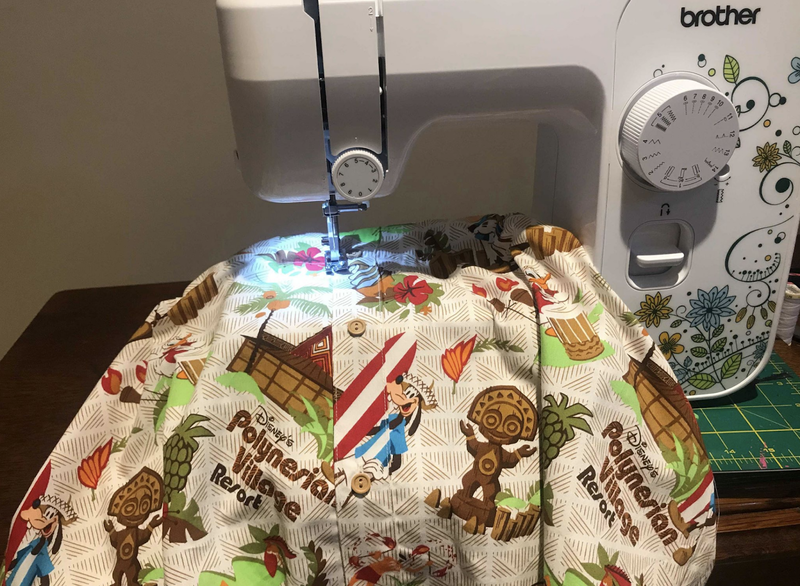 Then all of the fun creating and buying the Disney outfits to wear too! If you want to follow along and be part of the trip - follow me on Instagram @DisDreamGirls as I will be posting pictures there. 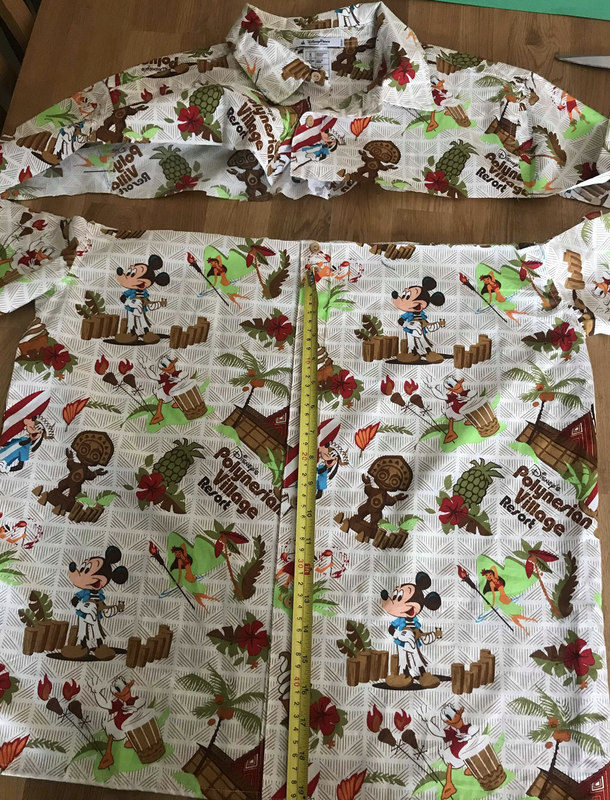 One month to my big Walt Disney World and Disney Cruise Line trip so I decided to take a look of the outfits that I wanted to take with me. 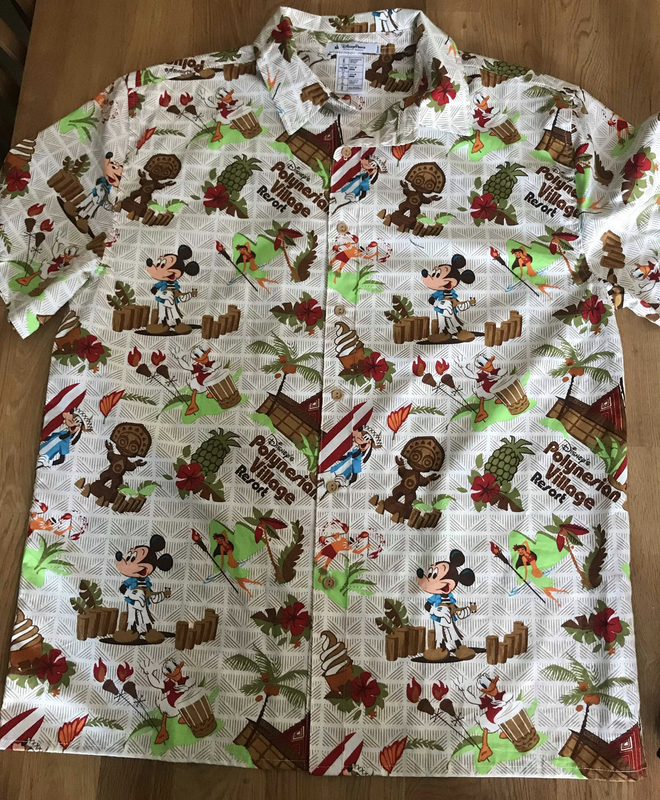 Following my substantial weightloss, my favourite shirt from the Polynesian Resort did not fit me. 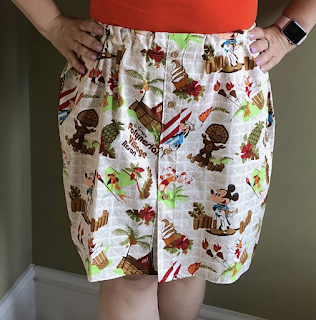 So I decided to upcycle it into a skirt - waste not want not and all that. Plus, it was a very expensive shirt! So the first task was to measure the length I wanted the skirt. I then added 2" to that to allow for the waist band. 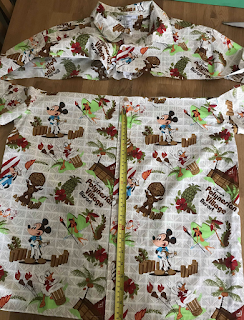 Next, I then marked up the shirt and cut along the fabric. 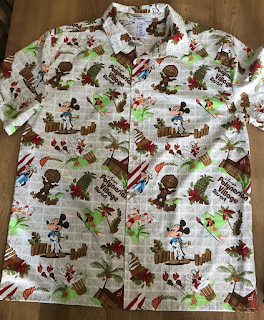 I felt really sad cutting into Mickey but it was pointless keeping it in the wardrobe for nostaligia-this had to be done! Next, I sewed across the armholes and then I was left with a rectangular piece of fabric. I pressed back a 1cm hem along the top and then stitched in a straight line (to prevent any loose ends fraying). After that, it was time for the waistband. I folded the fabric over by 2" and inserted elastic inside the fold. 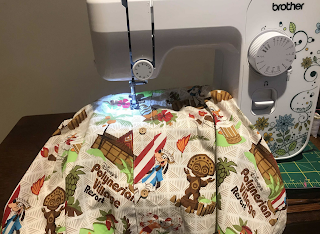 I pinned one piece to the fabric and the other I fastend a safety pin to it (so I would be able to push it along to join the elastic together. I then sew across the fold, enclosing the elastic inside. I stopped 9/10ths of the way round to pull the two pieces of elastic together and then sewed them across. Finally, I finsihed sewing in the elastic along the waist band I had created. That was it! From shirt to skirt in 40 minutes! I have two other Disney shirts and I intend to do the same with them also. Why not give it a go and let us know how you get on! 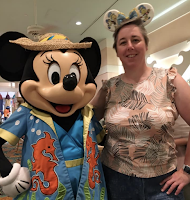 The month of June began with Michelle being asked to be a guest on the Dis Down Under Podcast to talk about the dining highlights of The Disneyland Resort. So we thought we would share our top Disneyland foodie tips with you. 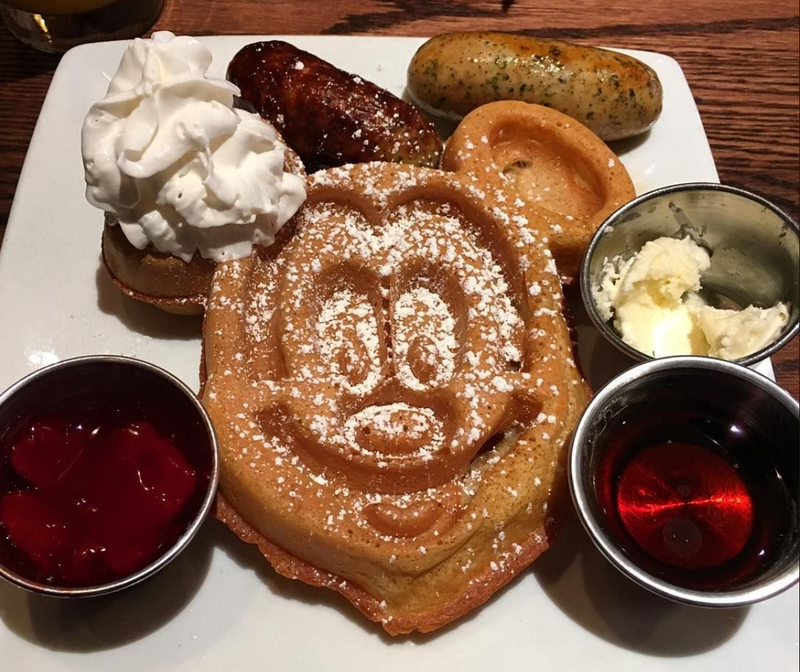 However, to listen to the podcast and hear food recommendations for Disneyland and Disney California Adventure go on over to - Dis Down Under. 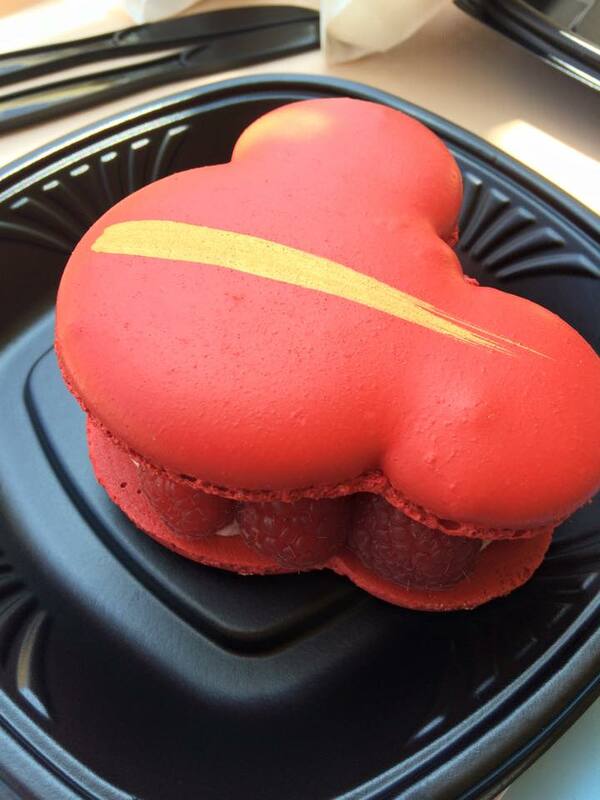 The place you can not afford to miss on any visit is the Jolly Holiday Bakery. 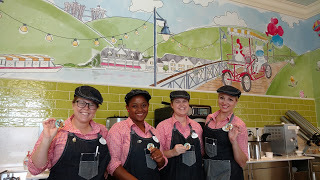 Found on the left hand side at the top of Main Street USA, this bakery is open during park hours and serves hot beverages, salads, soups and most importantly - something sweet. Our favourite items are: The Matterhorn Macaroon, The Raspberry Rose Macaron and the tomato basil soup with a side order of a grilled cheese toasted sandwich. 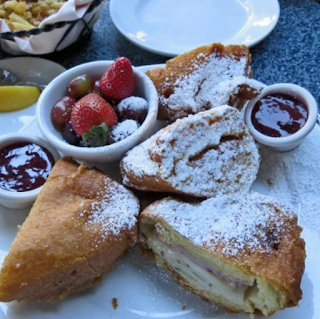 Other notable mentions (depending on your palate) include corndogs, Mickey beignets and churros. Moving away from snacks to the table service offerings, our favourite places are Carnation Cafe and Cafe Orleans. For a few dollars more than a quick service you can have lunch or dinner at Carnation Cafe and enjoy the ambience of Main Street. However, our favourite meal there must be breakfast because to have a giant Mickey waffle is the best way to start your day in the parks. Cafe Orleans is a fabulous place to eat and people watch (particularly if you are fortunate enough to get a table on the patio. The offer a range of options but for new visitors we heartedly recommend the Monte Christo sandwich - this is something totally unique! Imagine a sandwich with ham and turkey (though the offer a three cheese version) that is battered and deep fried, then coated in icing sugar and served with a fruit puree. 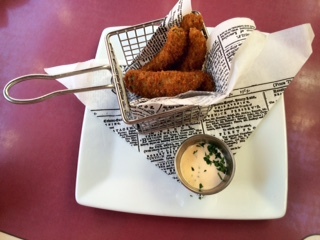 Yummy but filling - you can definately share with especially with their house prepared parmesan garlic house fries. However, a star draw has to be the Dole Whip and being able to take this iconic beverage inside the Enchanted Tiki Room attraction is a fabulous plus! We hope you have enjoyed this trip through the food of Disneyland and if you have a favourite - why not get in touch and let us know! May brought forth Star Wars Day on May 4th. 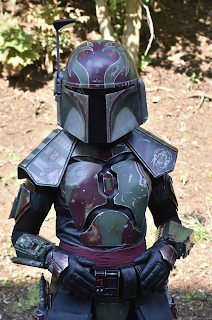 To celebrate, Jayne trouped with the two costuming groups that she belongs to. Yet again, Legoland Windsor held their annual Star Wars Weekend and this year, Jayne and her husband Simon were in attendance. April saw two fantastic trip reports. The first from Paul Barrie of Window to the Magic Podcast. On show 204, Paul shared with us the details of his first trip in over eight years to Walt Disney World. 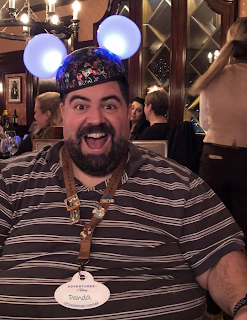 Then the following show, 205, we were joined by John Saccheri (aka Big Fat Panda) to discuss his recent Adventures by Disney trip to California and his first trip to Disneyland. It was a busy month with three other shows crammed in between! 203 and 206 Michelle and Jayne chatted through their Disney life, news and stories whereas show 207 ended the month with Erin Foster, co-author of the Unofficial Guide to Disney Cruise line, talking all about Disney Cruises. 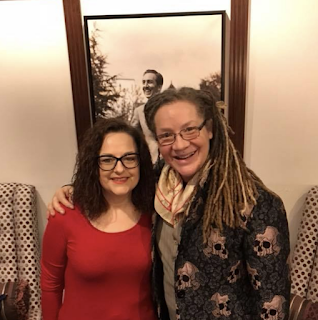 In March, Terri Hardin popped by to talk Disney with us on show 201. Terri is such a great friend to the show and we can also guarantee her appearances will delight one and all. We also shared on show 202 our guide to Disney's Animal Kingdom and it is full of top tips for you! Busy month on the podcast! 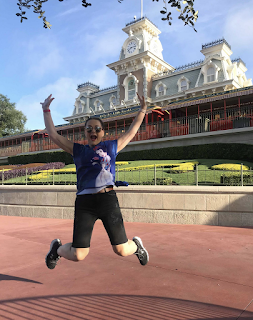 Show 195 shares our top tips for planning a trip to the Magic Kingdom - you will not want to miss this one! Happy 2018 one and all! 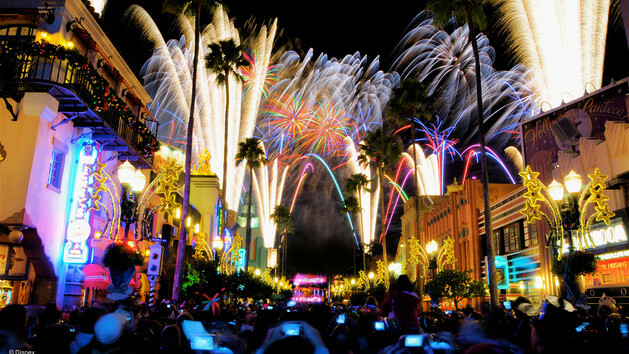 Here is to a happy year ahead for everyone and lots of fabulous Disney news! The countdown for the Last Jedi is getting smaller but conversely the amount of merchandise available is growing! 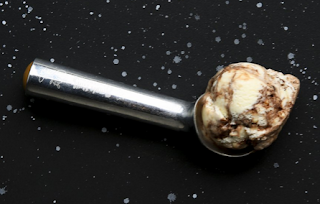 The latest product to catch our eyes is a range of ice creams. 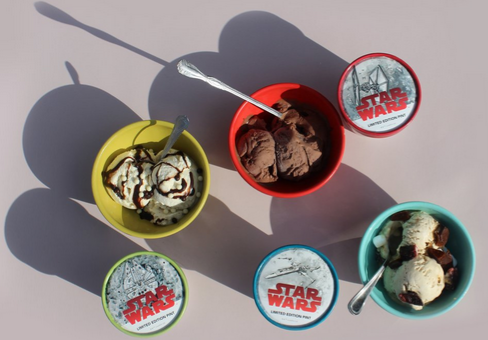 If you head over to Ample Hills, the team will sort you out with a Star Wars delight! 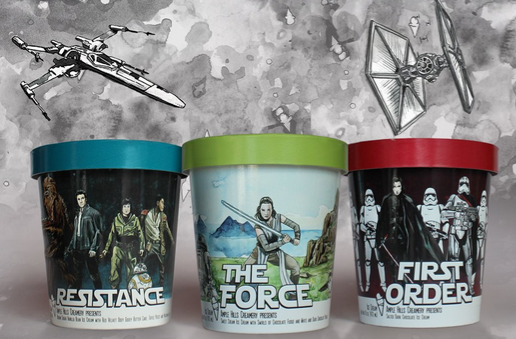 To showcase the monolithic, fierce power of The First Order, salted dark chocolate ice cream represents relentless villainy, while cocoa powder, bittersweet chocolate and a dash of powerful espresso reinforce the dark side. 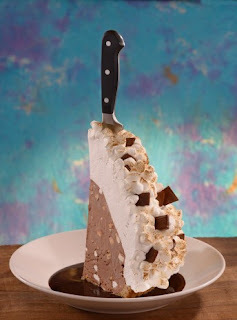 A celebration of the spirit and determination of the Resistance fighters who stand against the First Order, The Resistance is a brown sugar and vanilla bean ice cream with an assortment of mix-ins: passionate, fiery red-velvet ooey gooey butter cake, hard-edged toffee pieces and spirited, hopeful mini marshmallows. Inspired by the harmony and peaceful nature of the Jedi, The Force illustrates the precarious balance between the dark and light side with sweet cream ice cream, swirled with rich chocolate fudge, and set against a galaxy of white and dark chocolate pearls. If you manage to go and try - let us know! But don't forget to ask for the toppings! This November, the multi talented Terri Hardin has created the most gorgeous Jiminy Cricket figure. The piece is entitled - A Cricket Can't Be Too Careful, You Know and the first few will be dispatched in December, with further figures available in January 2018. So read on to find out more on how you can acquire one of these stunning figures. 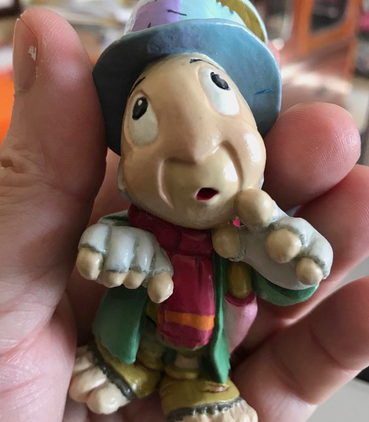 Jiminy stands at approximately 3 1/2" tall and each and every one has been hand painted in a staggering 35 different colours. He has been styled with his iconic hat, long coat and scarf in a thoughtful pose. Each figure arrives in a special box designed by Terri and inside there will be, carefully wrapped in When You Wish Upon a Star tissue paper, the Jiminy figure. This figure is an edition of 100 and comes complete with its certificate of authenticity. 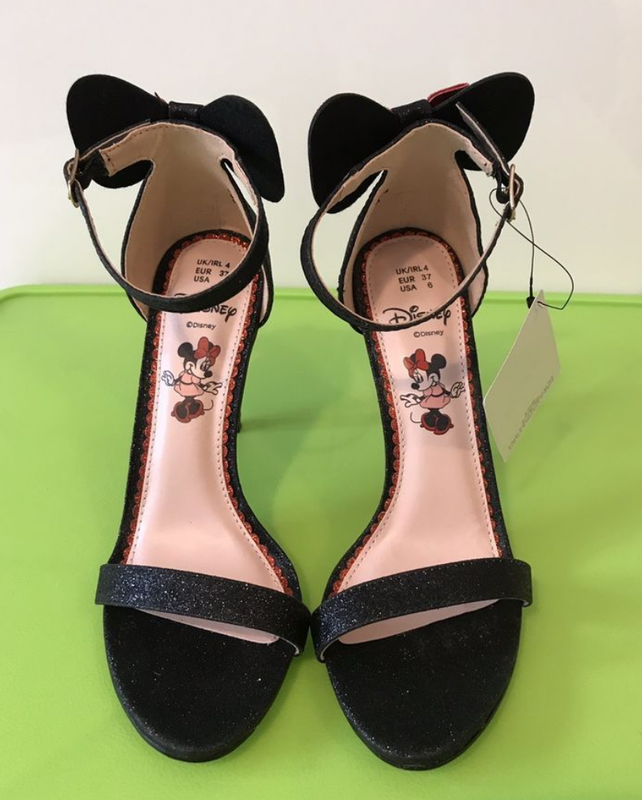 This will make an amazing gift for the Disney fan in your life. 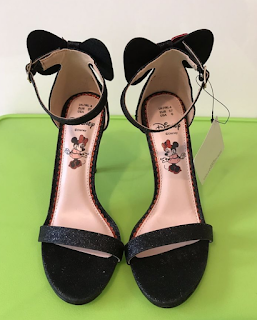 Jiminy costs $125 including tax. For clarity, we have in no way been given any financial reward from Terri Hardin for writing this. It has been written because Michelle is a massive fan of her work . 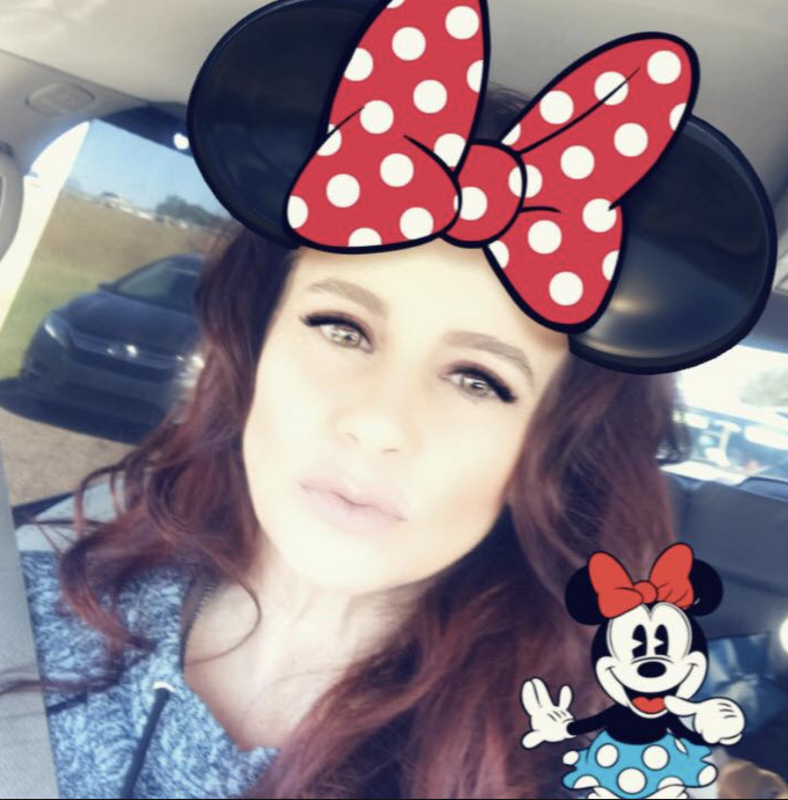 This October saw Michelle with a bad case of Disney blues so she decided to book a trip (as you do) and this time it is to Disneyland Resort! So arriving 23rd December she will be there for 10 whole amazing days! 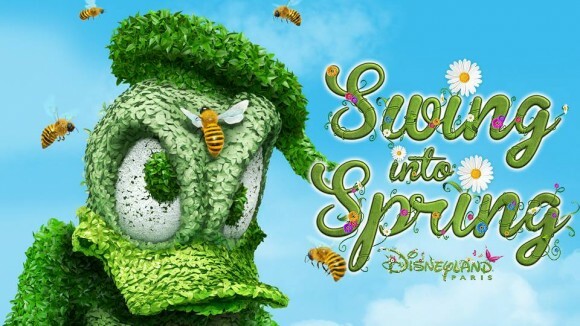 This summer saw more closures for Disney Hollywood Studios but on the positive side, there are some fantastic things coming up in the next few years! One Man's Dream has now become Walt Disney presents. In the newly titled area, you can find models of the new Toy Story Land, a segment of Galaxy's edge and lots of hints of what we can expect in these new areas. I for one am very excited about this new land and can't wait til 2018 to come round! 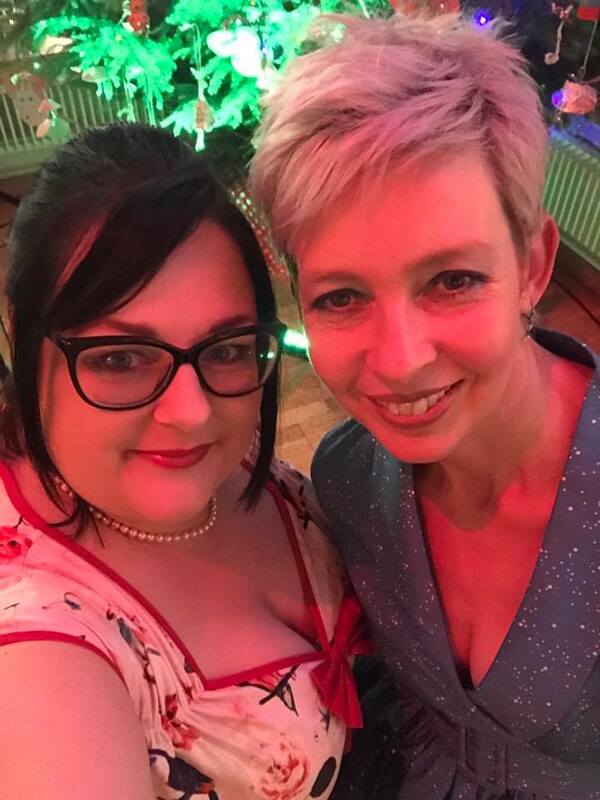 August for educators like Michelle and Jayne means one thing: holidays and no work! This year, Jayne holidayed at home and Michelle planned to go to WDW. 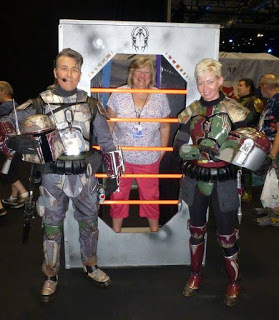 During Jayne's staycation, she made a trip to Star Wars Identities exhibit at the O2 and her review can be heard by our $5 and above patrons on our Patreon page. Additionally, Jayne visited her tattooist, Simon, and he did some final touches on her Disney sleeve. Whilst the picture below was taken awhile back, she will be updating her own blog with images very soon. 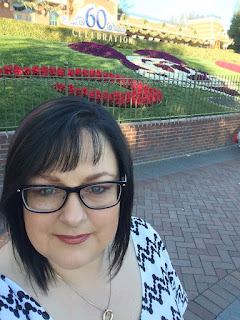 Michelle departs for Walt Disney World on the 18th and she has so many plans for this trip. If you want to hear more about her schedule, she discusses this on show 172 but stay tuned on our social media outlets for lots of updates. D23 Expo was held in Anaheim and brought lots of Disney news with attractions closing and details of those coming in the future. It is always sad to hear a favourite attraction is going away but here is hoping to the new attraction being amazing. We reviewed some of the best bits of the theme parks news on show 167 and 169. Alas on the 27th July, there was sad news. Marty Sklar, former vice chairman and principal creative executive of Walt Disney Imagineering (WDI), died. 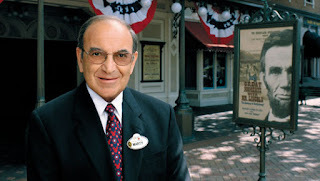 For 53 years he worked for Disney and his touch has been on many of the things we love and cherish about Disney today. Busy month on the Podcast as we reviewed our Paris trip, as well as talking about the many incarnations of Big Thunder. 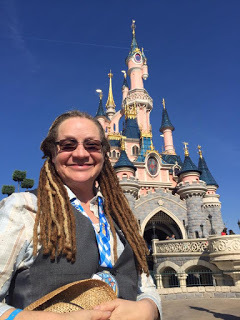 A joint trip to Disneyland Paris! Hear all about it on our podcast number 162. After podcasting together all these years, we are finally going to have a Disney Dream Girls trip to a Disney park! 31st May will see Michelle and Jayne make their way to spend four days in Paris to check out everything for the parks 25th Anniversary. We aim to record some audio and live shows to share with your all. Listen in to podcast 155 to find out more! Where has the year gone? I can't believe we are nearly into April! 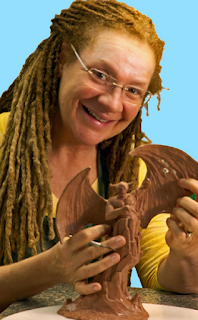 So, for this udate I would like to share with you details of an amazing project our good friend Terri Hardin is doing. There are only 25 days (as writing) to go! So why not find out more. 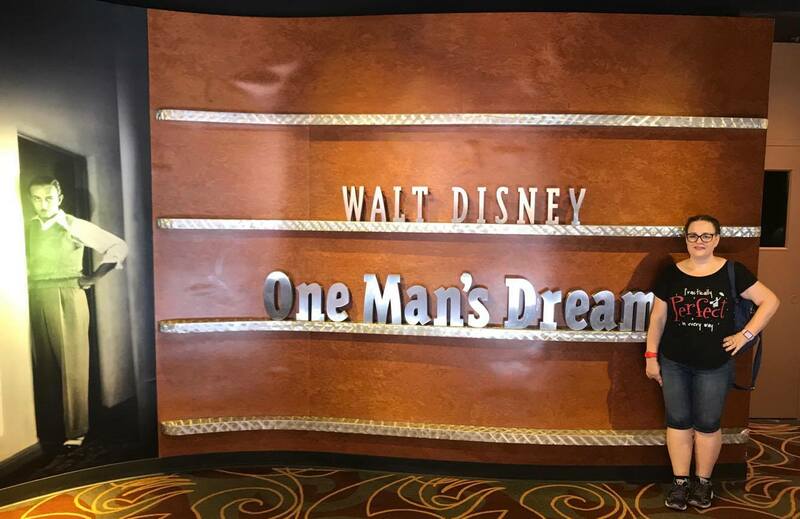 So what lies ahead for the Disney Dream Girls in 2017? We started the year with a podcast with the wonderful former Disney imagineer Terri Hardin. She talks about her trip to Disneyland Paris and what it was like to visit attractions she had worked on. To listen to the show click blog notes for show 139. 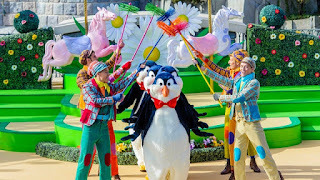 Then we looked ahead to what movie, theme park fans and Disney runners can expect this coming year, on show 140 and you can check that out by using this link blog notes for show 140. 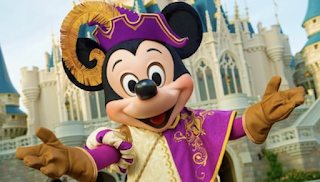 In upcoming shows you can expect trip reports from Shanghai Disneyland, Hong Kong Disneyland and Disneyland Paris plus more from our wonderful guests such as Jim Korkis and Terri Hardin. This is the start of our fourth year of podcasting and it makes us very excited to what is ahead for us and our Disney family of listeners. We can't wait to share it all with you! So please, if you haven't already, leave us an iTunes review, share our podcast with your Disney loving friends and contact us to share your Disney with us! 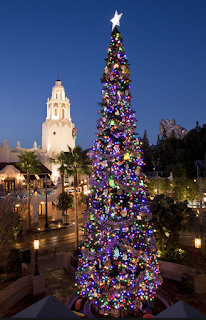 Christmas season in the parks is always a feast for the senses and if like Jayne and Michelle you don't have a trip planned, you somethimes have to make do with what you can. Both Jayne and I decorate our homes with Disney ornaments and treasures from past trips. Jayne has a fabulous Studio 56 collection and I set up my twin-track Monorail. Alas by smaller home meant I wasn't able to operate the EPCOT loop but well sometimes the resort loop alone will do the job! 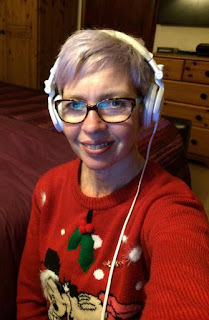 We also hopefully kept you entertained with a range of podcasts talking about Christmas in the Parks, plus Tom Ameen did a great stand in job as host as we spoke about his fabulous new album too. Alas there wasn't the time for Minxmas this year but we did celebrate three years of the Disney Dream Girls Podcast! A highlight for November was chatting to Dave Tupper and being able to share his families trips they had taken on the Disney Cruise Line. As yet, I haven't had the opportunity to take any cruises, so being able to live vicariously, via The Tuppers, made me very happy. Show 133 for 13th November 2016 can be read by clicking the link blog notes for show 133. 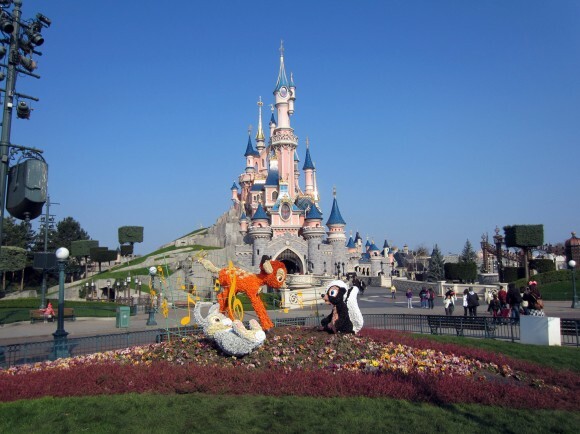 Another thing ticked off my Disney to do list, I visited Disneyland Paris during the autumn season. The park was dressed sensationally! Plus all the characters were meeting in their Halloween finery. Show 132 released on 6th November 2016 gives my full review and there are photos on the blog too! Use this link to find it Blog notes for show 132. 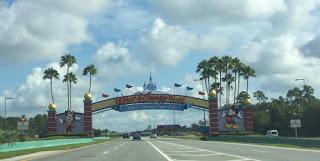 Nothing is as depressing as returning from a fabulous two week stay in Walt Disney World and have to return to reality! 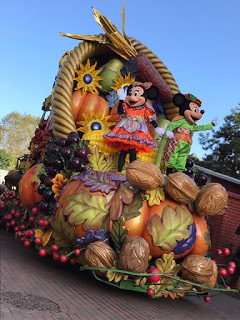 We have all been there but know I haven't a trip booked led me to having itching feet... so I managed to sort a trip over to Disneyland Paris for the pre-Halloween season - a massive first for me. 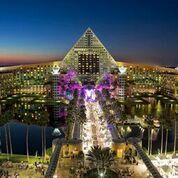 My August trip to Walt Disney World fed into many shows throughout the end of 2016 but my main trip report is on show number 124 dated 11th September 2016 which can be listen to by using this link blog notes for show 124. August. Summer arrived for us Brits on the 16th. Yup that seemed to be the day we had sunshine! As I am writing this, I am literally two days away from my trip to Walt Disney World. Over the past three years I have visited other Disney parks and left, my once favourite, neglected The 19th will rectify that! 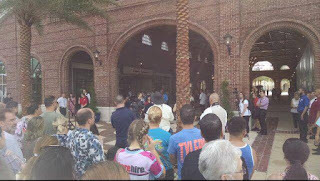 There will be all sorts of tours, meet ups, dining, attraction riding and parade watching. I really hope you will follow along, using our social media links @disdreamgirls or Disney Dream Girls to do so. Additionally, over the next few weeks, we wont be leaving you without podcasts. 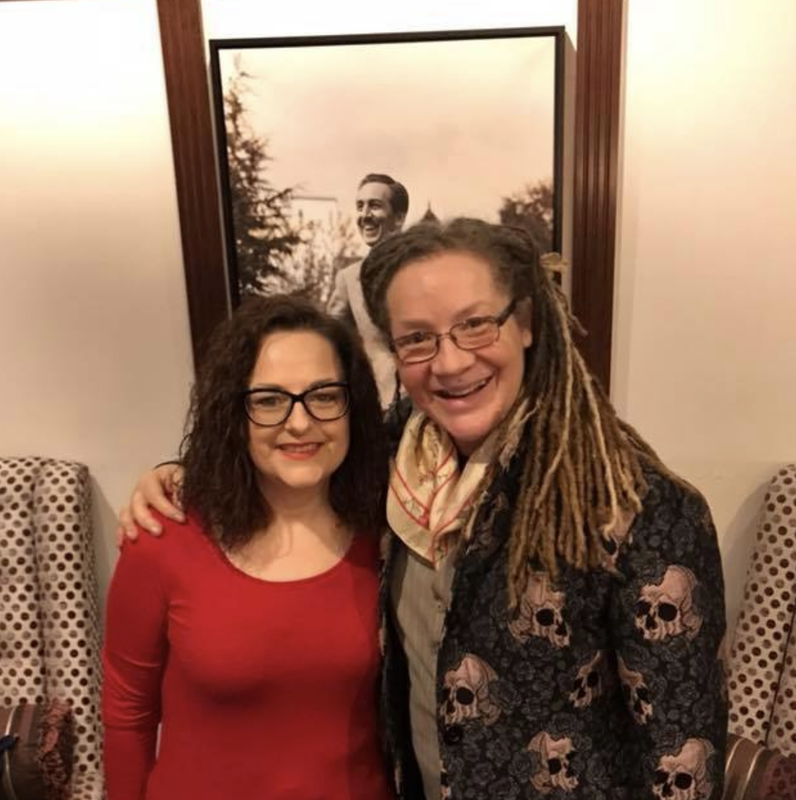 We have recorded shows for you as well as re-sharing a past set of interviews we did when we just began with the wonderful Jim Korkis. So happy summer and see you soon! 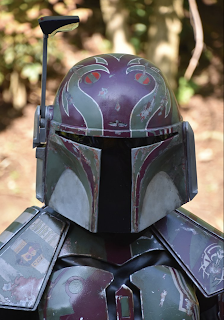 July saw Star Wars Celebration Europe. 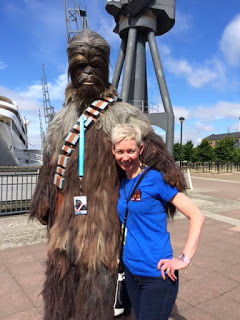 As the Star Wars fan of the duo, Jayne couldn't wait to attend. 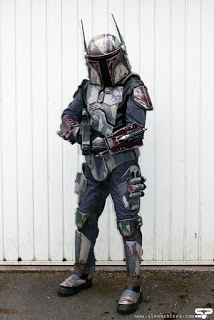 However, Jayne didn't just attend as a usual day guest, but as part of the Mandalorian Mercs Vok'Chi Clan. On the podcast, Jayne shared her experiences of attending and the legnths that her amazing husband went to, to ensure their outfit was stunning. I am sure you will agree, when you look at the amazing pictures below. As you can tell, Jayne and Simon had a fabulous weekend and definately was a different way to enjoy such a large convention. watch out as they will be doing more in the months to come! June brought around a crazy weekend trip to Disneyland Paris. Yes that's right - a weekend trip. 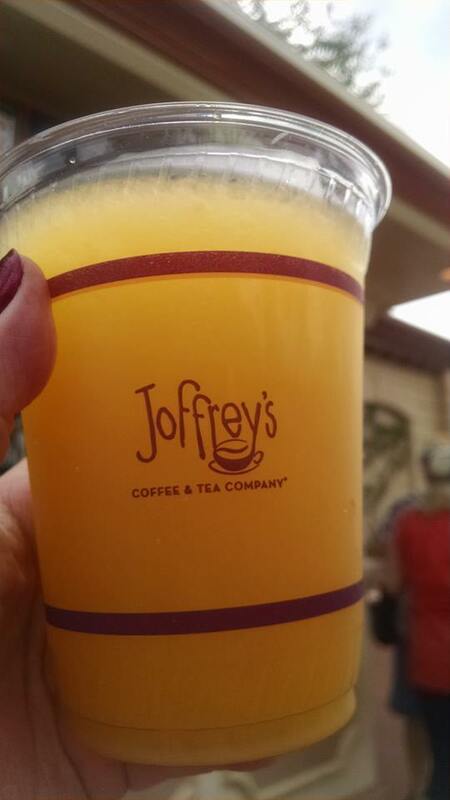 In fact it started off being a trip just to attend the amazingly fabulous Inventions Brunch. Whilst we spoke about this on the show, this is the sole place I will share all the pictures from the mini trip Michelle took with the Petar family. Arriving later on the Saturday morning, we spent Saturday enjoying our favourite attractions and funningly enough, having our evening meal at Inventions also. But the big highlight of the day, was to go the Snow White themed brunch in the Disneyland Hotel. Alas, this did not come to fruitition, a last minute theme change left a few people with tears. 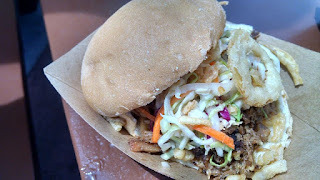 But the food and the characters in pirate attire did make up for it (well just a little). Here are some photographs from the trip. Finally! 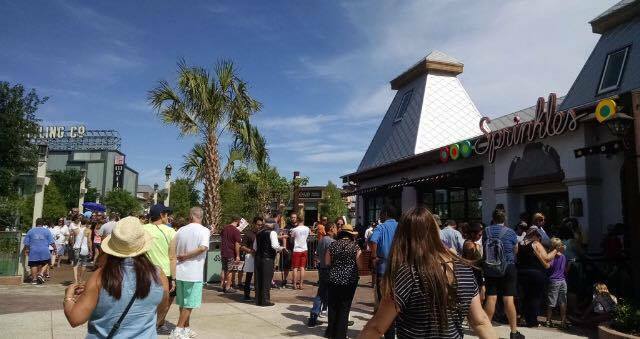 We are able to share some pictures from the opening day of the town centre at Disney Springs! Our wonderful princess made the trip, arriving just before the official opening ceremony. Firstly, there are 129 venues. Yes... 129. I was a little taken back by that figure. 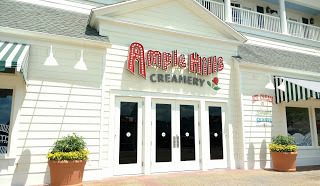 Shopping, entertainment, bars and eateries, in fact there is a little of something for everyone. Want to check out the store list, here is the list. 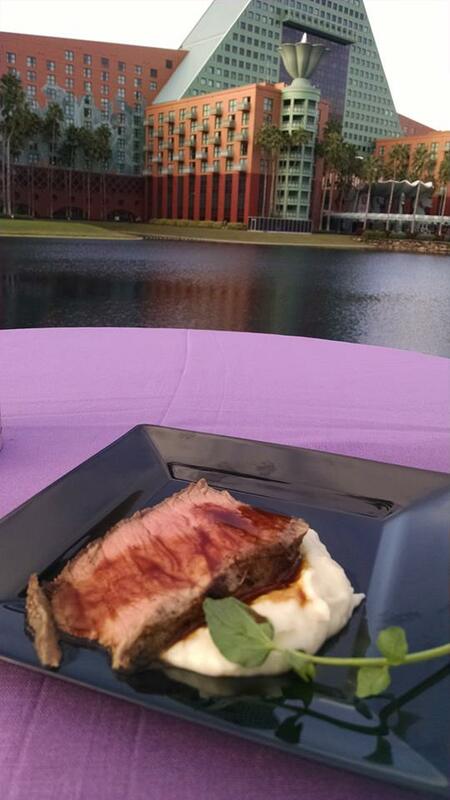 Chef James of Disney's Creative Development Team said that they have some amazing food offerings coming our way. We will have more information on podcast 108, which will be released on Sunday 22nd May 2016. We will have more updates, over the next few dates so keep checking back with us! For this post, I would like to take you to Walt Disney World. 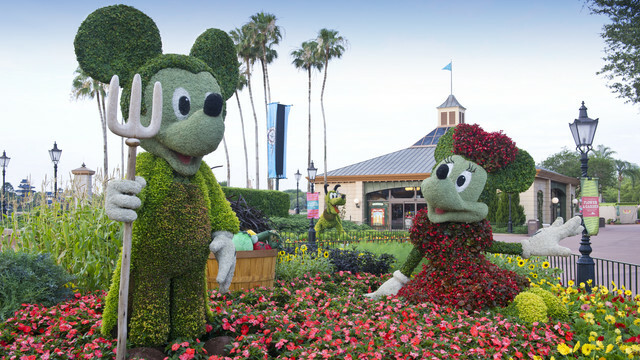 From 2nd March 2016 to the 30th May 2016, the EPCOT Flower and Garden festival brings a visual treat for the eyes and now for the palate. The introduction of food booths has been a massive hit, making this time of year a must do. Additionally, the weather is incredibly pleasant too and midweek crowds are at a very agreeable level. If you haven't visited at this time, read on and find out what you can expect. 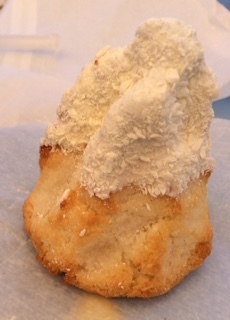 Firstly, it is a floral and topiary treat. EPCOT surely looks its best. As the pictures show, the horticultural team work extra hard to ensure the park is ablaze with colour and variety. Not only that, it is a celebration to diverse wildlife habitats. There are lots more of things to do other than admire the scenery. There are exhibits, seminars and demonstrations to be enjoyed. Additionally, children can be entertained in the event only special playground. Still want more? Well every Friday, Saturday and Sunday evening you will find in the Garden Rocks series in the America Gardens Theatre. To further enhance your experience, you can - for an additional cost - do the Gardens of the World Tour. This three hour tour is $69 plus tax and will give you a greater insight to the landscape and changing designs. For me personally, The English Tea Garden (presented by Twinings) is a must! Firstly, this is free of charge - something we all love - but being English and a tea drinker this fact filled tour sounds perfect. Finally (and I've saved the best til last), the food offerings. Around Showcase Lagoon you will find 13 stalls offering a very diverse range of food and drink. Here are some top picks. Are you interested in attending or have you already been? Tweet us @disdreamgirls or email us info@disneydreamgirls.com or visit our Facebook page - Disney Dream Girls as we would love to hear your experiences. We discuss the food offerings in detail on our podcast, show 095 released on 28th February 2016. You can find it in the iTunes stores alternatively, listen by using the link below. A quarter of the year is nearly over and there are so many things in 2016 I am excited about. Firstly, in a few days I will get to experience Disneyland Paris for the second time, this time with my son. I think sharing such experiences with others who 'get' the magic makes a trip definately more enjoyable. Paris does a celebration of Springtime called 'Swing Into Spring' and its bright, colourful and on a sunny day there is nothing better. Over in the USA, there are so many things going on - construction everywhere! Starting in California, they have brought back their food and wine festival to DCA. I'm so upset I won't get the chance to be there but I am assured my good friend, Tommy Allison, will be going and sharing lots of content with me. So maybe we should get him on the show to talk about it. Also in DCA, the new Frozen stage show is due to debut shortly. It will be fascinating to see what they have done with this and I hope there is a comedic element added as that is what made the Aladin show so much fun for me. 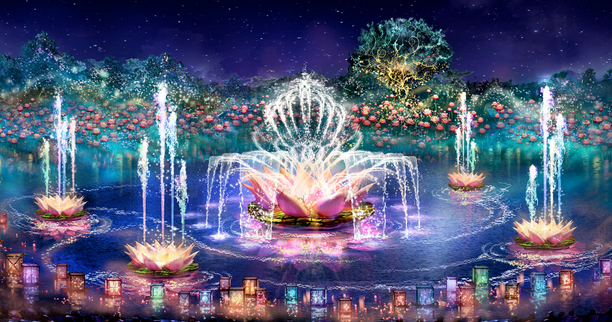 In Walt Disney World, 22nd April sees the opening of the Rivers of Light. I've seen photos and videos of the floats they are testing and they look fabulous. I know expectations are high for the Pandora section of Animal Kingdom but from concept art I saw at D23 it looks like those expectations will be met. So that is it for the March update, make sure you are following us on Twitter @DisDreamGirls Facebook - Disney Dream Girls, Periscope - Disney Dream Girls, Meerkat @DisDream Girls and in whichever podcast catching option you prefer to ensure you do not miss anything. February has seen me book not one but two trips to a Disney park. I am so excited about both of them! 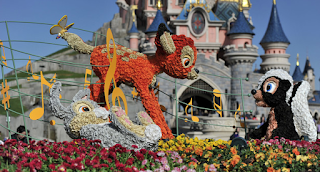 First, I am travelling to Disneyland Paris for five days, just after Easter. I am so excited about this and can't wait to share live audio and video feeds from this beautiful park. As a bonus, my son Ciaran is travelling with me and this is great as I will have a teenagers perspective on the park - so look forward to lots of content on Paris! I visited DLP last Spring, so I am really looking forward to going again to see their Spring offerings. Then, I have not been to Walt Disney World for quite awhile. However, I have just booked a split stay for August. During that trip, hoping to arrange a few tours, meals in some of the newer restaurants and meeting lots of my east coast friends! So that is the February update. I'll be back in March with another posting! 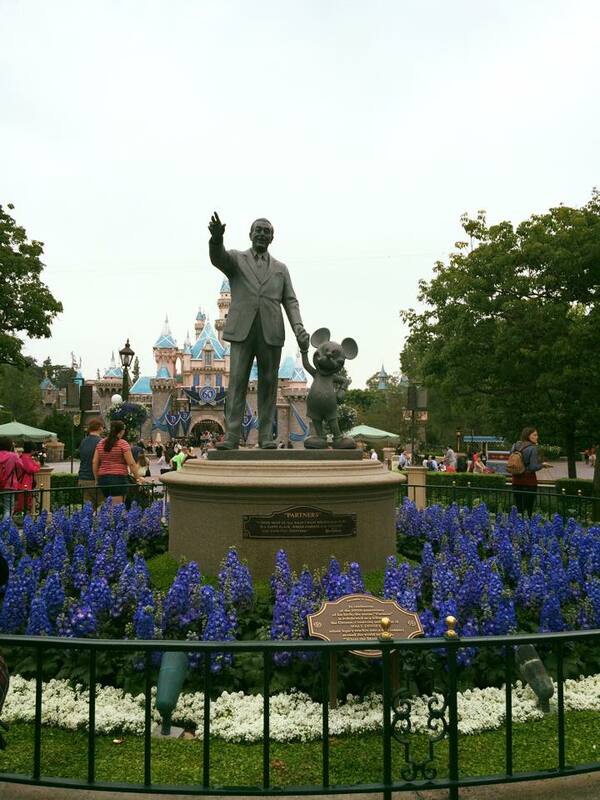 2016 has begun and my first blog is a reflection on my recent trip to Disneyland. It seems an eternity since I flew out on the 24th December 2015. Lets start with food. I was able to dine at the Plaza for a fun filled character breakfast on Christmas day, have the best steak at Steakhouse 55 (along with a gigantic slide of chocolate cake), have dinner and Fantasmic viewing at Club 33 and enjoy the delicious peppermint ice cream at the Gibson Girl ice cream parlor. I will be reviewing these in both blog posts and also on the podcast. Another highlight was the Christmas Tour, although I was a little disappointed that some elements had changed from the previous year it still is a great tour and the pin this year was amazing. Our next podcast will be available on 10th January 2016 and will have a a fun game your can play along with! Busy month for the Dream Girls as we have launched for its third year in a row - Minxmas! This month has been incredibly busy! And as usual our shows have reflected this. 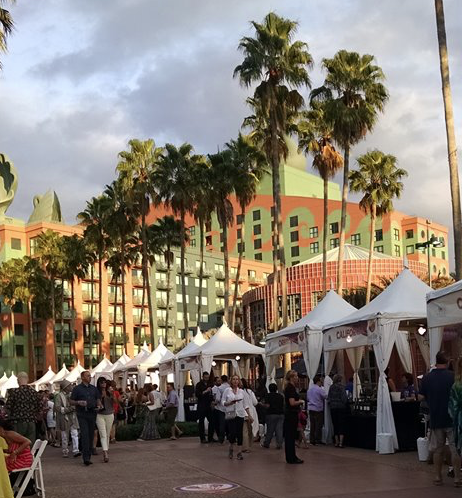 However, today we are going to whet your appetite to the next show as the Princess Papers blog, very kindly offered to attend the 2015 Swan and Dolphin Food and Wine Classic on 31st October 2015 on our behalf. So prepare your appetite for some mouthwatering pictures! This year was the events 6th anniversary and it looked like another fabulous event. I was so disappointed that yet again I couldn't attend! One year my friends it will happen! Anyway, back to the event. 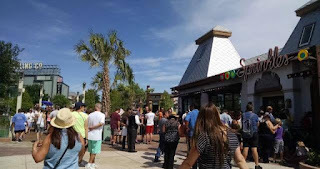 On the causeway, between the two hotels, a transformation occurred turning this mundane walkway (where usually you can walk to the parks or catch a friendship craft) in to a mini food festival. Showcased was the food available at the hotels nine eateries, with added celebrity chefs, a range of beers, wines and cocktails. Additionally, there were a range of seminars included with the admission cost. 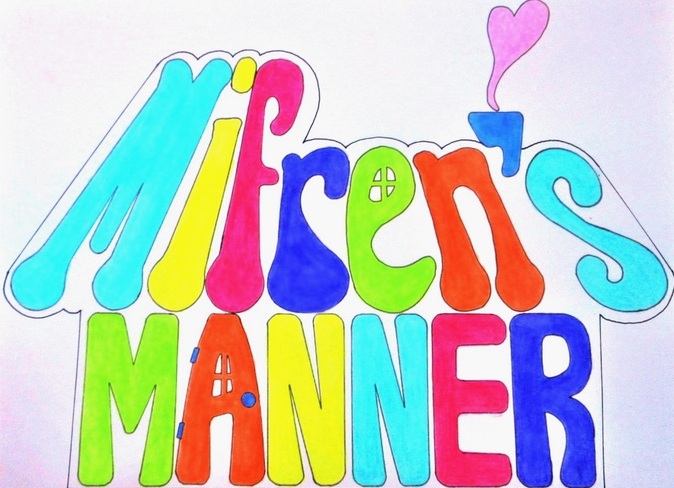 Whilst not personally an attendee, Jeanie said it was a fabulous, successful and tasty event. Well apart from the s'mores sundae action station, there was a bevy of delicious desserts. Above you have eclairs with coffee caramel pecans and then an incredibly decadent raspberry and dark chocolate fondant cake with raspberry mousse and finally on the far right is a boozy vanilla rum baba. Plus there was lots more! 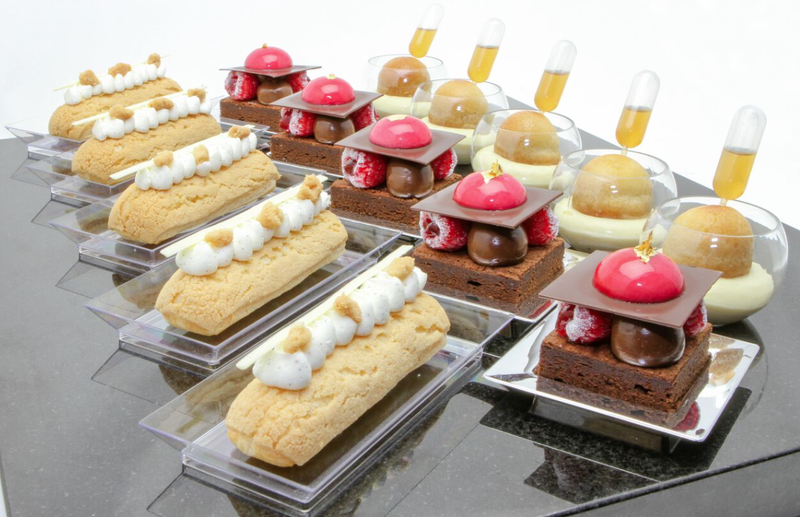 Having eaten desserts at the Swan and Dolphin restaurants, I can confirm the quality and originality of them is second to none. I recall one of the creations having a flame effect as it was presented in front of me! I guess we had best look at some of the main courses! 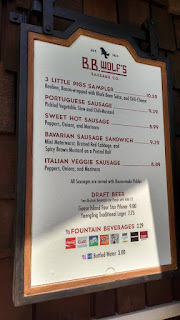 As mentioned before, the foods offered give a taste of what you can expect if you ate at one of the hotels restaurants. 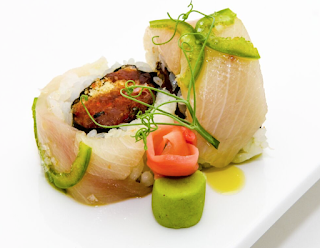 Whilst not necessarily menu items, they give a fabulous insight to the quality of ingredients, the flavours and style of each place. Personally, it is the attention to detail that struck me in both the food at the event and in the restaurants; every element is right so that each mouthful delivered visual impact and maximum flavour. For a full review, listen to show 070, which will be released Sunday 8th November 2015. For my past three trips I tried, in vain, to ride in the Lilly Belle car that runs on the Disneyland Railroad. This trip I was determined I would achieve this 'bucket' list item. Allow me to share some details on the what and the how of this. What is the Lilly Belle? It is a carriage that runs as a caboose on the Disneyland Railroad. Inside you will be transported to a time gone by. Once inside, the first thing you will notice is the very ornate, decorated in Tibetan mahogany and plush burgundy velour. The carpeting is the same as that found in Walt's apartment above the firehouse. The history of the carriage reverts to its original use as a general carriage. However, in 1974 it was retired. Imagineers wanted to realise Walt Disney's idea of having a presidential car. So they decorated it in wicker but Lilian Disney did not like it so she gave instructions on how she envisaged the carriage. Then in her honour, the carriage was named after her. How do you ride the Lilly Belle? Firstly, the Lilly Belle does not run every day. Schedules for the days trains are only finalised on the morning of operation. For it to be running, it requires sufficient staff and the weather to be dry. For staffing, at least one cast member from the railroad team will need to be present. Alas, in times gone by artefacts have 'gone missing'. 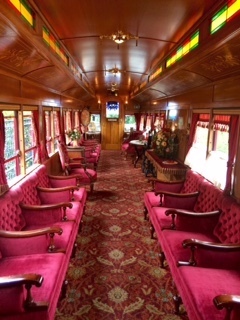 The guard will then take pictures (only when stationary at stations) for guests and explain some details about the carriages history. Additionally, they pass round a photograph album showing Walt's connection to trains. 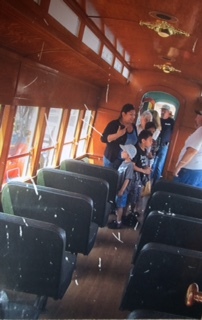 Regarding the weather, the carriage does not allow guests when it is raining. This is because they do not want the carpet spoiling. Also, as the carriage has only wall fans, it gets incredibly hot. Therefore, it is usually only run once or twice in the mornings, when it is cooler. 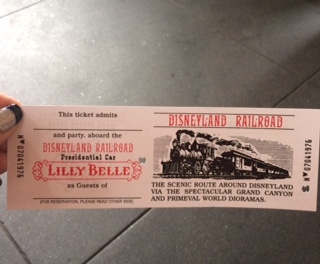 All riders on the Lilly Belle get a souvenir 'ticket' and the privilege of riding. August saw D23 and the announcements, the meets ups and the merchandise sent social media into a frenzy. As an attendee of D23 I made it to the Parks and Resorts presentation. So I thought I would share some of the main announcements. I went to find hall D23 around 90 minutes in advance . The queue was being 'held' on a lower floor and guests were able to line up for three sections. To the side of the room I saw abandoned overnight sleeping kit, something which may have guaranteed them great seat. The seat I had was very near the back so I was thankful of the large video screens. 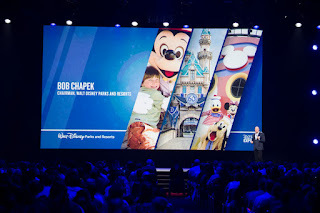 Then Bob Chapek (chairman of Walt Disney Parks and Resorts) , came to the stage to open the presentation. Then he introduced an imagineer to present the project they had been working on and the next and so on. Whilst it was great that it was the lead imagineer on each project that presented each parks update, it was lacking a little of the WOW factor. It reminded me of the Apple keynote presentations, rather than a company known for its pixie dust. Season of the Force – This new seasonal event, beginning early 2016, brings new experiences to both coasts this includes special entertainment, themed food locations and Hyperspace Mountain – a reimagining of the classic Space Mountain attraction in which guests will join an X-wing Starfighter battle. Disney’s Hollywood Studios (DHS) will feature a new fireworks spectacular set to the iconic score of the Star Wars movies on weekend nights. Star Wars Launch Bay – Opening later this year, this interactive experience will take guests at DHS in Florida and Disneyland park in California into the upcoming film, Star Wars: The Force Awakens, as well as the first six films in the Star Wars saga. Both east and west coast USA parks will have a Star Wars Land. 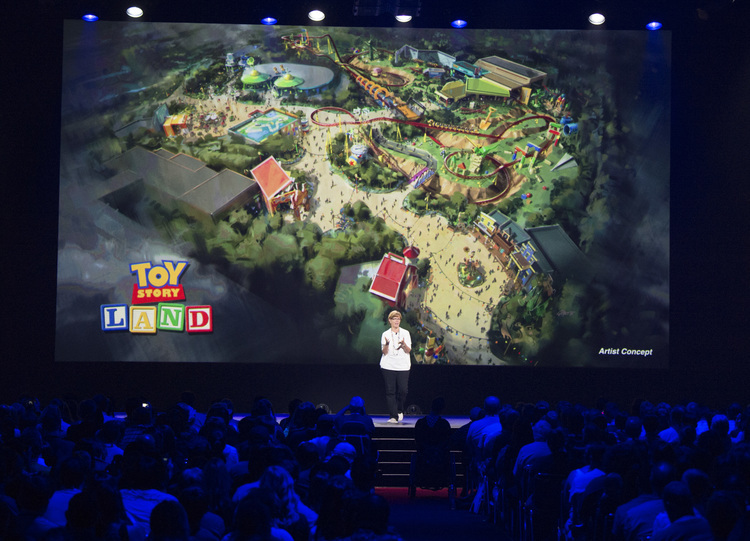 An all-new 11-acre Toy Story Land will be created at DHS. Guests will become part of the adventurous outdoors of Andy’s backyard, including two new Disney Parks attractions (a slinky dog roller coaster, an alien flying saucer spin ride and a Toy Story Midway Mania expansion). Some details were given about the construction of the new land at Animal Kingdom - Pandora – The World of AVATAR, with the lands name being confirmed. Details were given on of the flying ride 'AVATAR Flight of Passage' and “Rivers of Light” – Expected to open next spring, “Rivers of Light” will be an innovative show unlike anything ever seen in Disney Parks, combining live performers, floating lanterns, water screens and swirling animal imagery. Also Kilimanjaro Safaris will be extended for a new nighttime adventure next spring, where guests will travel through the African savanna amid the magically extended orange glow of the setting sun and discover two species new to the attraction: African wild dogs and hyenas. Finally, Soarin' Around the World will debut at Epcot in Florida and Disney California Adventure in California and guests will journey to far-flung lands, fly above some of the world’s most unique natural landscapes and soar over man-made wonders. Was it worth the wait, I guess so. However, it was nothing that I couldn't have found out via social media and perhaps even had a better view from the comfort of home. Friends at WDW Happy Place Podcast suggested, that Disney should stream D23 live, whether on a pay per view or freely available basis - that I would be interested in! 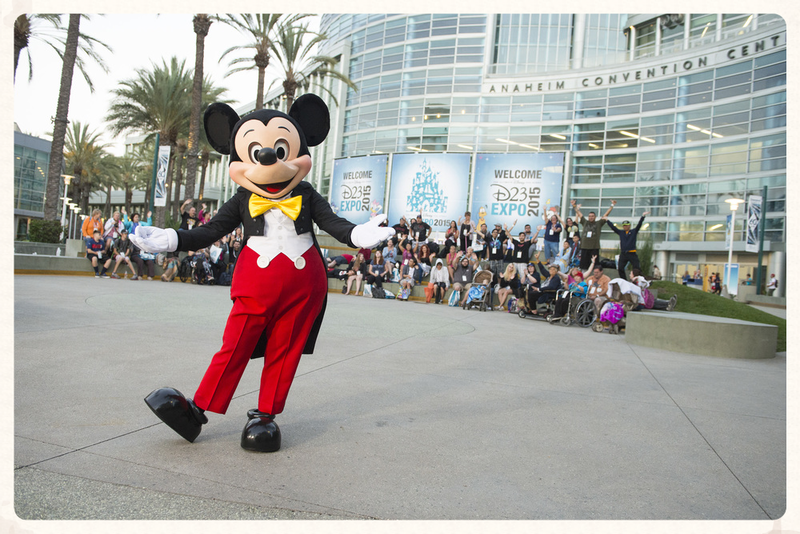 Would I attend D23 again? Probably not, but it was nice to say that I had done it. 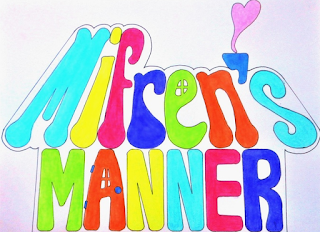 As of writing, 24th July 2015, we have won an award! 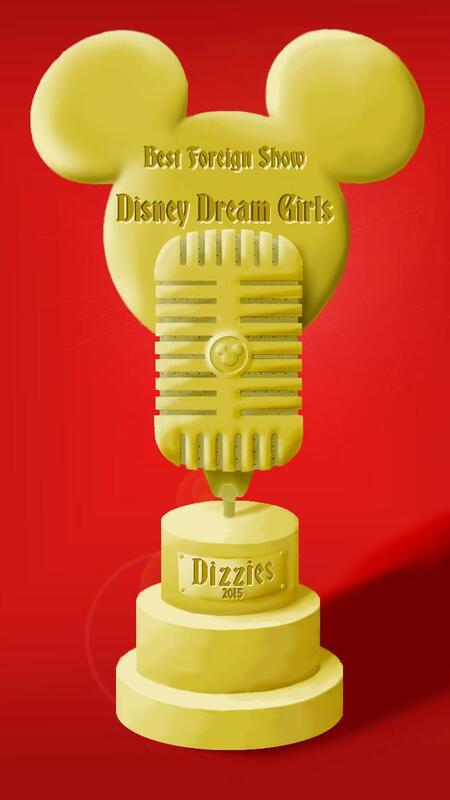 The 2015 Disney Podcast award - aka The Dizzie for the Best Foreign show. Wow! We are stunned, delighted and incredibly proud to win this accolade, especially when the other two nominated shows have been podcasting a lot longer than us and are fantastic shows in their own right. We do this show because we love Disney theme parks and we enjoy sharing our passion with other like minded people. So to get this, means you guys, our listeners must like what we do. So thank you! We also won this in 2014 too so we are incredibly grateful for all the love and support our listeners and the judges have shown us. I recently interviewed the well known Disney artist, Dave Avanzino and thought I would share some of what we talked about (and glorious pictures of his work) with you. However, if you wish to listen to the full interview search for it on iTunes ‘Disney Dream Girls’ episode 45. This is tricky! Dave himself finds it difficult to describe his work although he does say its a type of paper sculpture. However, it’s not true paper sculpture as that is when an artist gets a red piece of paper and cuts a shape out, airbrushes then bends it. The way he work is that he uses paper but typically as digital prints that have come from an original painting. 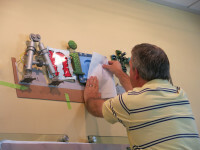 Then he does reproductions of them, cuts the pieces apart, layers them into a dimensional pieces before finally placing them in a shadow box. He additionally, may use other materials alongside this with the paper such as metal and wood. Above, is a series that was originally created for Disneyland’s 50th, which Dave has just announced, via the Disney website, that it will be re-released for the 60th along with the official 60th diamond marking. 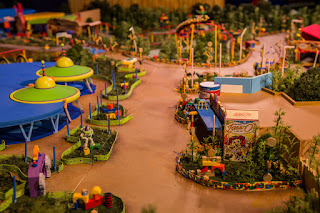 Additionally for Disneylands 60th, he created an image of the iconic park. 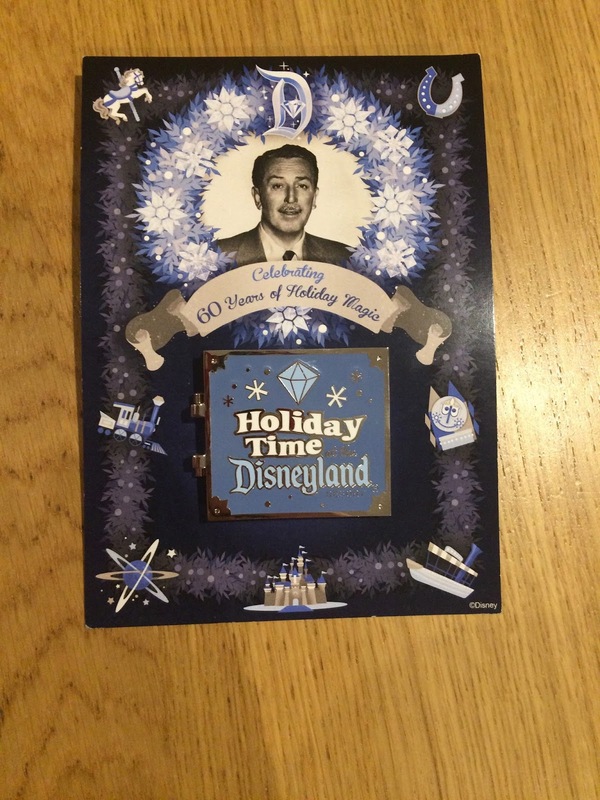 However, to the left you will see a similar piece that he created for Walt Disney Worlds 40th anniversary. There are two part attractions however, that Dave has featured quite extensively and that is Pirates of the Caribbean and the Haunted Mansion. During our interview, Dave also spoke about many other Dave also spoke about many other projects including visiting the Disney vaults. Boy! How jealous was I! 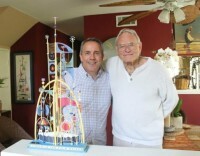 Recently, Dave had the pleasure to take a piece of work to show Rolly Crump and spend some time in his company talking about his role at Disney imagineering. How amazing is that? Have you any Disney artwork by Dave? What do you think to his work? Remember to hear more, track down our podcast (Disney Dream Girls) in iTunes or any podcast catching places. 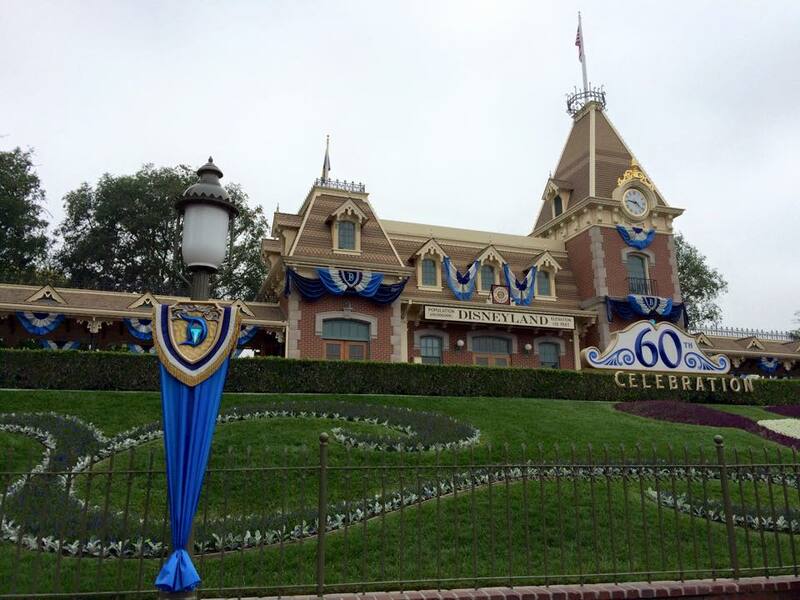 The 60th celebrations for Disneyland have begun and I just had to fly out to go and take a peek look at what Disney had in store for everyone. Once through the turnstiles, I must have stood in awe for around ten seconds as the sight ahead of me was stunning. I can assure you that you will also feel the same! The whole park is looking amazing. From the delphiniums to the castle, everything has been blinged up. 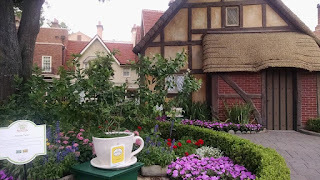 On a one day trip to Disneyland there is so much to cram in so I stayed within Disneyland Park itself. I'm afraid Disney California Adventure will have to wait for my August trip! So my priorities were to ensure I hit the Matterhorn (due to the new Yeti enhancement), see the Hatbox Ghost in the Haunted Mansion and then avail myself of the new fantastic evening parade and fireworks. First stop, the mansion! The imagineering team did not let me down! It is a fantastic addition and the only comment I can add is that they now must pay a little more attention to other areas to ensure it keeps up with hatty! I then visited the Matterhorn. I must admit previously I have found this attraction bumpy and hard going on my back. However, this trip I had a front seat in my vehicle and I loved the ride. It was smooth! Also the Yeti sound effects and visuals were stunning. By now I was hungry. 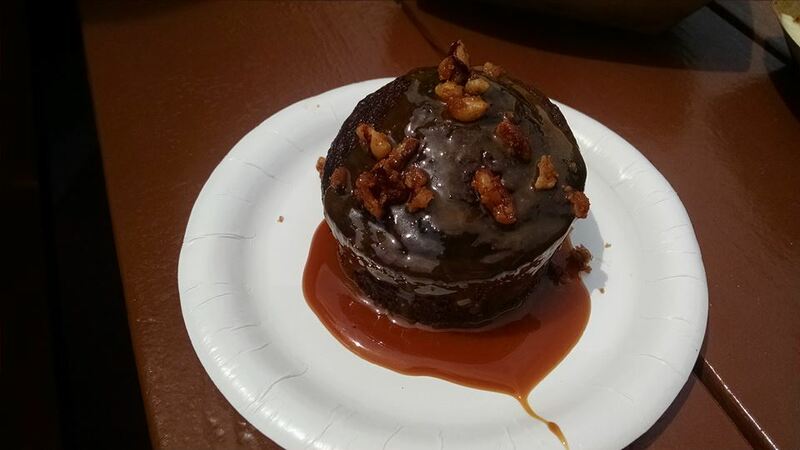 Normally, I'd plump for a table service meal but time was tight so I went to the Jolly Holiday Bakery and my firm favourite did not fail me. 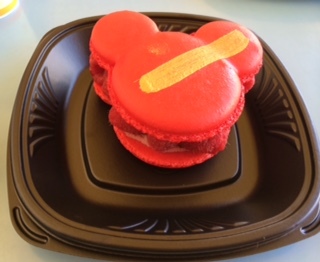 The Raspberry Rose Mickey Macaron at just over $5 is a fabulous decadent but filling snack. The raspberry flavour is sublime and the macaroni had just the right level of chew to crispness. As the day flew by, I saw crowds gathering on Main Street, so I knew it was time to grab a parade spot. 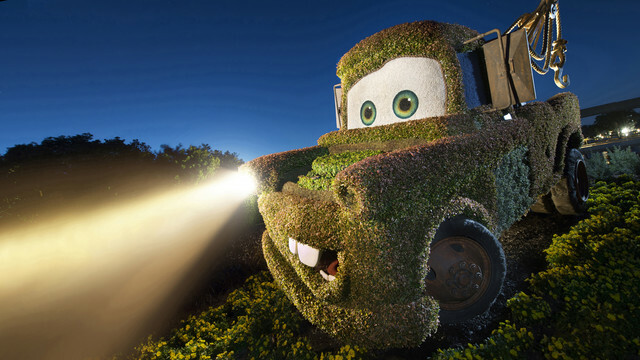 Paint the Night Parade has a million dazzling lights and it is spellbinding. No wonder people started to queue up three hours in advance of the show! As I have only seen this parade once (in person) I will discuss it in more detail following my August trip, along with the fireworks (which are AMAZING!). Our friend Ricky Brigante, has a fabulous video available for you to watch and enjoy - though better still - go and see it in person! 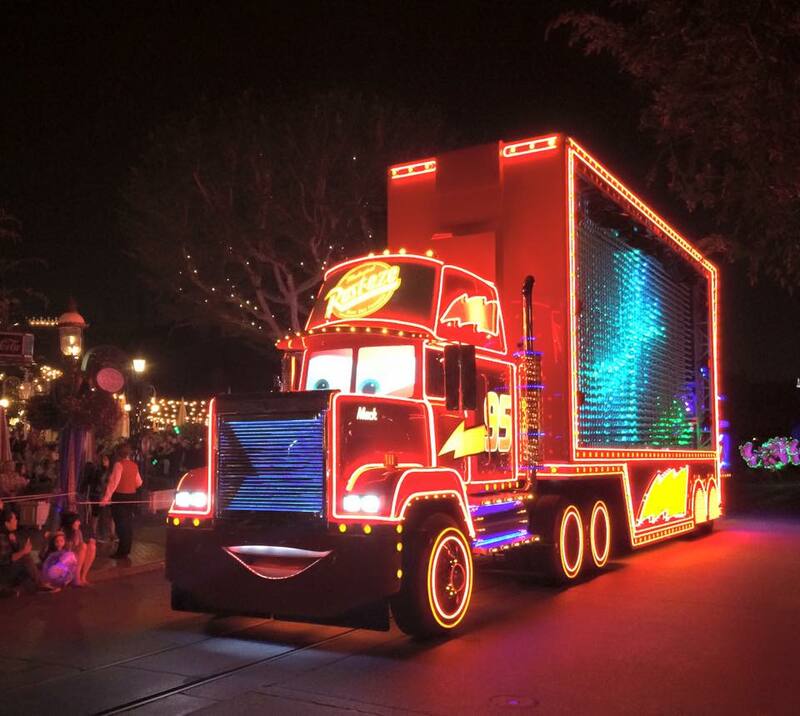 Inside The Magic - Paint The Night Parade Video. In a few days, Michelle is going to Disneyland Paris for the first time... what can she expect to see there? Well Spring is in full swing for a start! Listen to upcoming shows for more information! 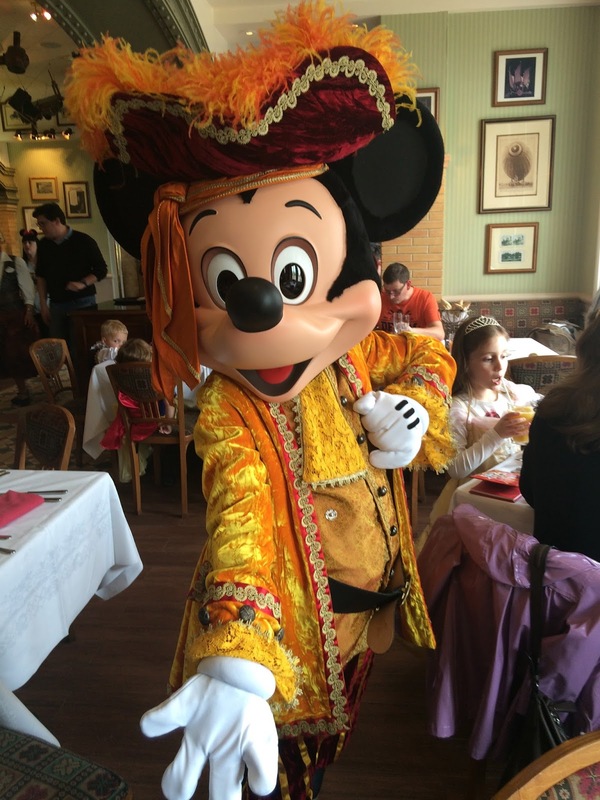 Also, looking ahead to the latest show, 5th April 2015 sees a foodie challenge and talk of Disney Cruise Line coming to the UK!